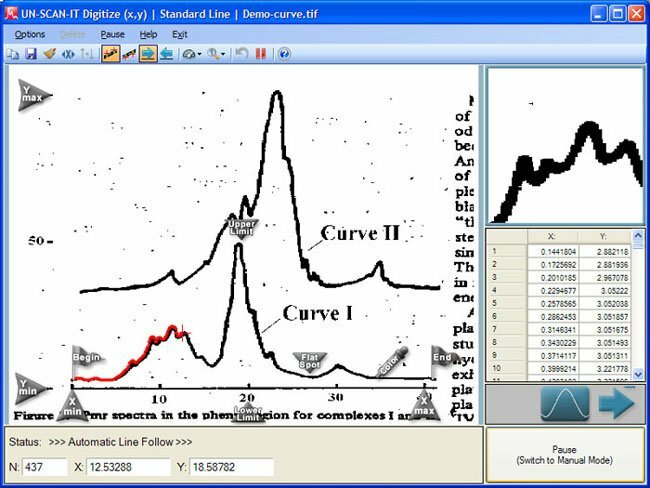 The UN‑SCAN‑IT software can convert your scanner into an automatic Plot Digitizer. UN‑SCAN‑IT can use any standard image (JPG, TIFF, GIF, BMP, PNG, etc.) to digitize plots, graphs, and charts. With an simple drag and drop interface, the UN‑SCAN‑IT software turns your computer into a powerful xy digitizer. Simply load the image file, then drag and drop the Setup Icons to define the scaling points (see Figure 1). Figure 1. Setup Icon locations for digitizing Curve I on the sample plot. After the setup icons have been positioned, the UN‑SCAN‑IT software can automatically digitize the plot by following along the curve and converting the image into real (x,y) data values (see Figure 2). The (x,y) data can then be analyzed, or exported to other software. Figure 2. 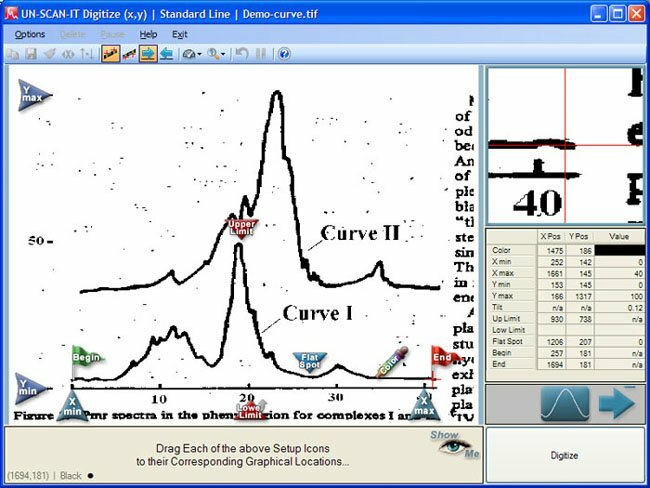 Data on the sample plot is Automatically Digitized using the UN‑SCAN‑IT software.